Figure 1: A cross section of the new type of elbow in use at Chromalloy. Suspended material coming from the right forms the slowly revolving soft mass of product suspended in air. The soft ball revolves slowly, and is self-renewing as some new product is added at the top and particles leaving the bottom deflect and join the main product stream. One of the new elbows installed at Chromalloy. Chromalloy was using standard elbows on its 4- and 5-inch diameter pneumatic conveying lines, which carry barite from the grinding mill to the storage tanks where it is stored prior to loading into hopper cars and bulk trucks. In the grinding mill, the barite is ground into fine particles minimum of 3% retained on a 200 screen. Then the material is pumped pneumatically through the lines into the storage tanks. 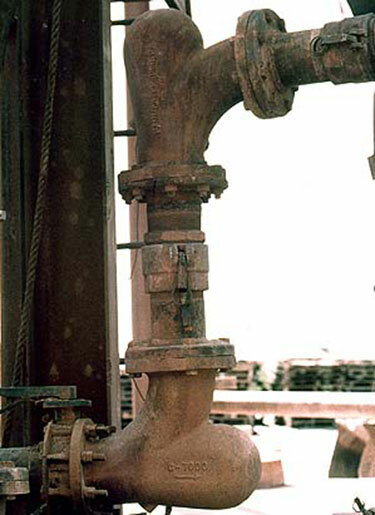 The elbows in use, which were standard types for pneumatic conveying, caused two different problems, both of which added to maintenance expenses and caused frequent shutdowns. The first problem was premature wear. The ground barite (technically, barium sulfate) has a high density — 170 lb/cu ft. In this application, the elbows were wearing through in approximately 90 days. Chromalloy engineers tried many methods to extend elbow life, even to using a double-walled approach, i.e. putting larger elbows over the operating ones, and filling the interior space with concrete and other materials. This procedure did not improve the situation appreciably, however. Replacement of the elbows was an expensive, time-consuming task. Also, frequent shutdowns were required in the operation. The second problem was equally as severe. Because of the loss of velocity in rounding bends, barite dropped out at the downstream end of the elbows. Finally, enough barite had collected to plug the pipe completely, forming an obstruction so dense it had to be removed by a combination of a sledge hammer plus high-pressure air in the line. When this method was not successful, the pipe had to be dismantled, and a long hose of high-pressure air inserted. This resulted in downtime. Two years ago, in an effort to solve these problems, Chromalloy decided to try a new type of elbow, the Smart Elbow® deflection elbow, as a replacement for those that were causing problems. The new elbow, available in a wide choice of materials, comes in sizes of 1-1/2 to16 inch in diameter, and angles of 45 or 90°. Chromalloy uses cast-iron elbows, in 4- and 5-inch diameter sizes, and 90° angles. The elbows are designed with a chamber; when the system is started, a soft rotating ball is built up in this chamber, composed of the conveyed solids suspended in air (see Figure 1). The ball slowly rotates during operation — particles enter the ball slightly above its center, and the off-center force causes a slow rotation and a return of air and particles at the bottom. This crosses the incoming stream at more than 180° — deflecting most of the material around the elbow. With a conventional elbow, materials hit the outer wall, and either slide along or bounce off and impact on the inner wall. The impact can quickly destroy an elbow, as happened previously at Chromalloy. With the new type of elbow, wear is cut down or eliminated because of the previously described deflection. The new elbows have performed very well. There has not been a single case of pipe plugging at Chromalloy in the past two years. In fact, no maintenance problem of any kind has been reported. No replacements have been needed, except for a single case when a forklift truck accidentally hit one of the elbows. Plant personnel like the flanged construction of the elbows. If one wears out at a future time, no welding would be required to replace it. Also, the plant has found that the energy required for the product to turn the bend is less with the new Smart Elbow deflection elbows than with the previous kind — lower system pressure is required from the blowers which supply air to the system. The Smart Elbow deflection elbow is a product of HammerTek Corp., Bethlehem, PA.